I would like to thank the committee for a well-run show and for their kind hospitality. 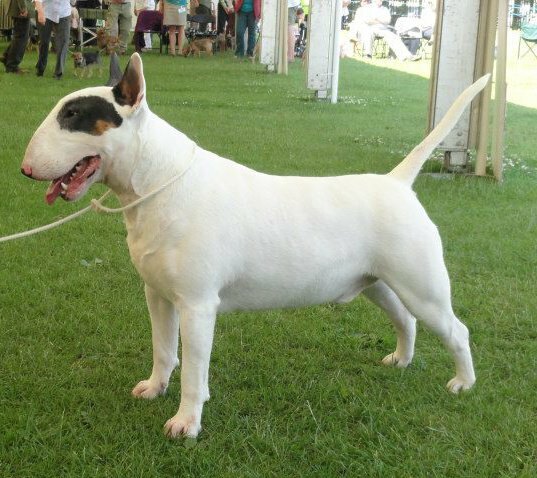 What the entry lacked in quantity, it more than made up for in quality and with no absentees in Bull Terriers. I would like to thank all the exhibitors for attending on one of the hottest days of the year. Quality white with well filled head and wicked expression, mouth ok. Well sprung ribs, short back, good topline and angulations. Moved adequately. One I considered for top honours. (Litter brother to first) Upstanding brindle & white. Long filled head, correct mouth. Straight front. Very good bone and angulation. Moved freely. Impressive white. Super head, completely filled, well placed ears and excellent expression. Correct mouth. Ultra short back, deep chest, good topline and bone. Front needs to tighten, another contender for the top honours. Moved very well. Heavyweight white, head need more profile and fill, correct mouth. Good bone and straight front. Showed well and handler got the most out of him. Feminine tricolour, strong filled head with sweeping profile. Good ear and eye placement. Correct mouth. Straight front, neat feet, nice reach of neck, flowing body lines with good angulation and tail placement. Moved freely, but rear movement was a little close. Quality white. Strong filled head with well set ears and eye placement. Correct mouth. Straight front with good bone, short back and strong quarters. Moved freely. Smaller than first, lovely head, correct ear and eye placement. Mouth fault. Straight front, short back, good angulation and moved freely. Smart brindle & white. Nicely turned head. Mouth fault. Straight front and good topline. Flowing bodylines with good angulation. Moved well. Didn’t make the most of herself in the heat. Elegant red & white, nicely filled and turned head, correct mouth, straight front, good angulation and moved freely. Handler got the most out of her on a very hot day.